Allows use of TST24 or ST24 without a table or desktop. Raises shooting table surface 24 in. from the ground. 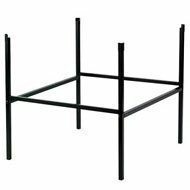 Made of heavy-duty square steel tubing for maximum support. Crossarms are strategically placed for light mounting. Made in U.S.A. If you have any questions about this product by Smith-Victor, contact us by completing and submitting the form below. If you are looking for a specif part number, please include it with your message.